That just happened. I'm in a complete fog, it could either be the fact that I was up until one-thirty and woke up at six or the fact that the Boston Celtics just completed the single greatest turn around, from one year to the next, in professional sports history. Did I want a double-overtime thriller? F*CK NO. The Celtics did what they needed to do. Send the Lakers back to L.A. on the heels of a 39-point blowout. Leave no questions on the board as to who the best team in the 07'-08' NBA season was. In doing so shut down Kobe completely and emphatically. Celtics 131 Lakers 92, ballgame. The defense of the Boston Celtics anchored by Kevin Garnett was nothing short of spectacular. As the former Finals MVP and current Heat guard, Dwayne Wade, put it just before Game 6 "This is the best defense I've seen in my time in the NBA" and later added "When we play the Celtics, I'm not guarded by one guy on the court, but all five guys." If Game 6 wasn't a 48 minute snapshot of that stifling defense I don't know what is. Whether it was Pierce, Ray Allen, or James Posey pestering Kobe, each of them made sure he had a hand in his face. When Bryant took the ball inside help immediately rotated toward Kobe forcing a pass or in some cases an immediate turnover. The goal wasn't to shut Kobe out, that's impossible. The goal was to contain Kobe and if he was going to take over a game it'd take a herculean effort. Between Lebron James, the Detroit Pistons, and Kobe Bryant the Celtic defense took care of business. I've bagged on the reigning MVP for a bit too long now. Kobe isn't Michael, we get it. I don't feel bad for the multi-million dollar athlete who already possesses three championship rings, but I do respect his ability and that's it. Not Phil Jackson, Pau Gasol, or Derek Fisher will help him win a championship. The truth is, the Celtics played him better than anyone else did. Kobe and the Lakers waxed San Antonio, took out Utah on the road, and made quick work of the Nuggets. They had a great regular season and were the class of the West, the thing is though, the West doesn't bang like the East. Even Detroits big men would have given Pau and Lamar fits. If Kobe wants to win another championship anytime soon he'll have to bank on Andrew Bynum, who is a pretty good player. Sorry Kobe, good luck winning the gold in the Olympics. I won't lie, from day one I doubted that 'Big Baby' Davis was a guy that the Celtics would benefit from drafting. This morning my words are officially swallowed. I think one of the most amazing story lines in sports are the guys that come right out of college onto a winning team and win a championship in their first full season of a professional sport. When some players go their whole entire career without winning a championship or even sniffing a finals like P.J. Brown before this season, like Paul Pierce and Ray Allen as well. Then a guy like Davis comes into the league and what luck, he plays well enough to suit up night in night out then BAM an NBA Championship just like that. Not only did Davis play in last nights Final, he played well. More than just an energy guy off the bench, Davis grabbed boards, played Pau tough, and got to kiss the trophy at the end of it all. Congrats Big Baby, I was wrong about you. Ray Allen and Kevin Garnett, Thank You. Truly. It sounds lame and a little on the dramatic side but Banner 17 wouldn't have even come close to coming true if either of you hadn't agreed to come to Boston. Even though we were ready to sell Ray Allen down the river after the first two rounds of the playoffs, he showed up big time in the NBA Finals. Ray's 7 for 9 from behind the arc in the clinching game 6 was unbelievable. Ray may not have the personality of Pierce or the intensity of KG but his game is just as good. The UCONN Alum is one of the top shooters over the past ten years if not THE top, let alone that at all times I'd argue he is the smartest player on the court. As for Kevin Garnett, how's it feel? The man who was once known for his inability to carry a team to a championship now will have a ring dawning that finger. Kevin Garnett allowed players like Pierce and Rondo to gamble all season long on the defensive end of the court. They could go for steals, blocks, and really defend close to the ball because of number five standing behind them. Garnett shrunk somewhat in the Finals but really stood up in game six, the one game he really needed to. The intensity that KG brings to the C's every game is something I've never seen out of any Celtic. 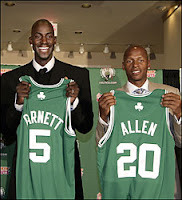 Both Allen and Garnett deserved to add the coveted jewelry to their resume, I applaud that. My WTF moment of Banner 17 would be when Celtic captain and future broadway actor Paul Pierce decided to dump an entire bucket of red gatorade on Doc Rivers with two minutes remaining on the game clock. Love the enthusiasm, I know this is a monumental monkey off your back, but this isn't the NFL, your not on a field, and Doc is rocking a pretty expensive suit I assume. This is what Paul either A. Didn't think of or B. Looked over. 1. With time on the clock the basketball might venture down the Celtics bench, if a freshly poured bucket of gatorade is all over the floor it will undoubtedly stop the game have to be cleaned up and extend this romp of a game even longer. 2. I can't recall a basketball game that someone actually did this. Was Paul just bucking the system and showing us all that basketball can play dump the cooler on the coach? 3. I can't assume there were to many guys on the bench to stop him and say, "Paul, this might not be a great idea when everyone is running around after the game" Between Perk and KG, zero college credits. Rajon and Perk, the future of the Boston Celtics. The difference in game 5 was that Perk had one arm and Rajon was still hobbled. Rajon played like an all-star against the Lakers during game 6 and even though Perk had five fouls, he was able to throw Pau off his game early and keep KG out of foul trouble. What seemed like 15 steals for Rondo was only 6, but to go along with his 21 points and eight assists, Rondo was great. If Perk continues to progress over the next couple years with Garnett alongside him, the future looks solid for him. As far as Rondo goes, I think he is a legit all-star in this league, relatively soon. To the Truth, Seventeen. Paul Pierce officially placed himself among Celtic greats. His number would have been hung in the rafters win or lose a championship, but with a win it's so much sweeter. Pierce is the lone player remaining of the 2002 Eastern Conference finals C's. Pierce kept the Celtics in the playoffs with his 40 point performance against the Cavs in the second round. Paul was the driving force behind the Celtics 24 point comeback against the Lakers in game 4. What else can we say about this guy? Finally the national media talks about the play of one Paul Pierce. The only player to ever mention his own accolades in a post game interview, the only man to ever high five a security guard in an empty hall while yelling "one more baby, one more." While I think it is very possible that Pierce has knee surgery over the summer and gains 30lbs, I could care less at this point. I love Paul Pierce, and I love the way he showed up Kobe on the biggest stage. He is and will always be, The Truth. Congrats to the 2008 NBA Champions!!!! !